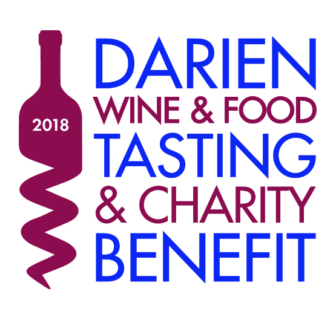 The Darien Chamber of Commerce’s 14th Annual Wine and Food Tasting & Charity Benefit on Thursday, Oct. 18, with gourmet foods, fine wines and a silent auction. People can purchase various wines they enjoy that night at an advantageous price, plus a portion of the sale is donated to the nonprofits. This is a terrific time to buy wines for the upcoming holidays and as gifts for family, friends and business associates. 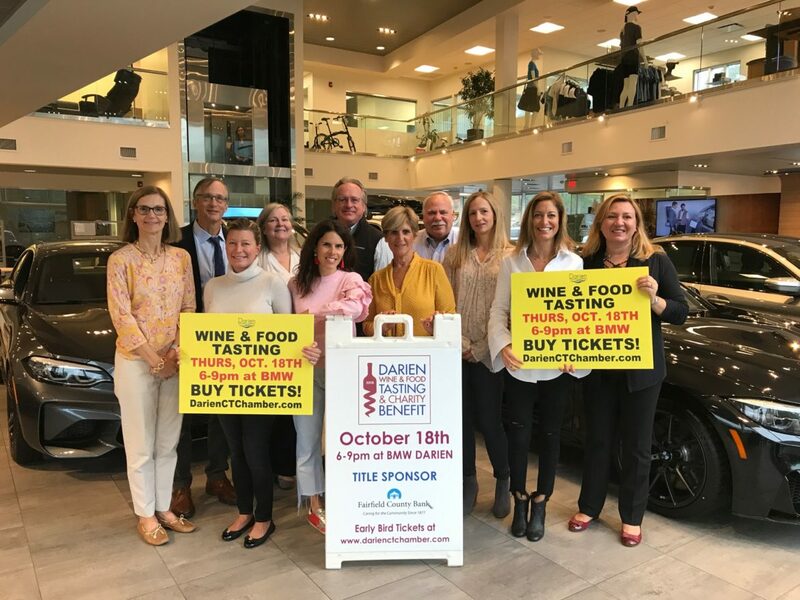 “This Wine & Food Tasting event is the perfect example of bringing our local business and retail community, restauranteurs, Darien nonprofit organizations and area residents together to raise money to benefit our community,” said Susan Cator, president and executive Director of the Chamber of Commerce. Here’s 17 seconds of the event in 2016 — recognize anybody? Wine samples will be offered by the WinePort of Darien. Food tastings will be offered by Darien Butcher Shop, Darien Cheese and Fine Foods, Fjord Fish Market, The Goose American Bistro, Louie’s Italian Restaurant, Michael Joseph’s Fine Foods, Palmer’s Darien and SoNo Baking Company. 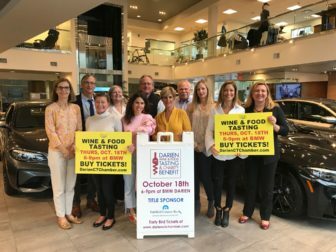 The 14th Annual Wine and Food Tasting & Charity Benefit takes place from 6 to 9 p.m., Thursday, Oct. 18, 2018 at BMW of Darien, 140 Ledge Road. Advance tickets can be purchased online at the Darien Chamber $65. Advance tickets are available until Tuesday, Oct. 16 at the Darien Chamber of Commerce website. The price at the door is $80. Parking is offered at Whole Foods in the rear of the lot. A silent auction will feature many special items from Chamber members and friends of the Darien Community. 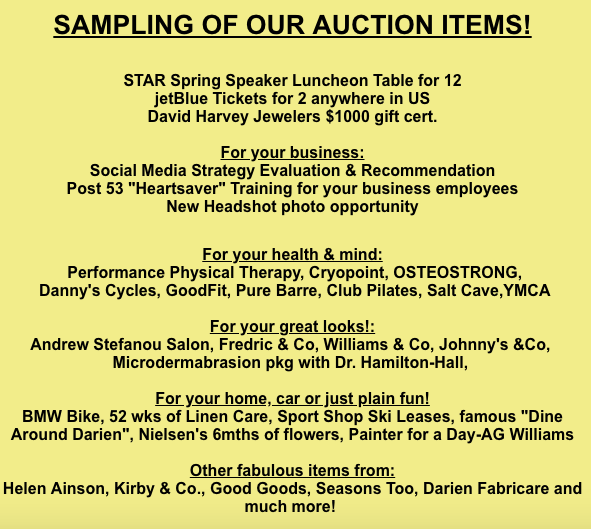 The silent auction will include a wide variety of items including JetBlue tickets for two, a table for 12 at STAR’s well known speaker luncheon April 2019, and a $1000 gift certificate to David Harvey Jewelers. There will be auction items from Darien’s favorite shops, businesses, fitness boutiques, spas, the well-known “Dine Around Darien” basket and special collections of wines. The Darien Chamber Fundraiser will benefit the Depot Youth Center, STAR, Inc. and the Darien Chamber Charitable Foundation. The Depot Teen Center is a nonprofit organization providing youth with a drug- and alcohol-free environment. STAR, Inc. benefits people of all ages with intellectual challenges. The Darien Chamber Charitable Foundation supports four community-based college scholarships and the Holiday Lighting on the Post Rd in Darien. Special thanks to the event sponsors: Fairfield County Bank- Master Sommelier Sponsor (Title Sponsor). The Vintner sponsors are: Baywater Properties, Federal Realty Trust, Hollow Tree Self Storage and PG Properties. DCC Wine & Food Tasting & Charity Benefit Event Committee Left to Right: Susan Cator, David Epprecht, Cheryl Williams, Laurie Griffith, Gina Vivenzio, Al Tibbetts, Martha Spiegel, Peter Saverine, Jennifer Thompson, Kathy Arrix and Teresa Jandziol. The Collector Sponsors are The Hawes Team, Nedder & Associates, LLC, Patriot Bank, People’s United Bank, J.N. Ruddy Builders, and TD Bank. Special thanks to the Media Sponsor Darien Times and Hersam Acorn Newspapers. The Mission of the Darien Chamber of Commerce is to take a leadership role in promoting the business community and quality of life in Darien. Bankwell and Laurel Road Bank are Elite Sponsors and First County Bank is a Select Sponsor of the Darien Chamber of Commerce and support the Chamber in all its events throughout the year.